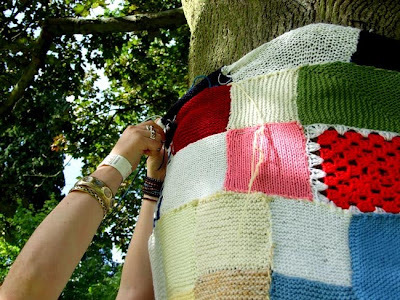 Fusion Festival and the creation of the Collective Tree Cosy. 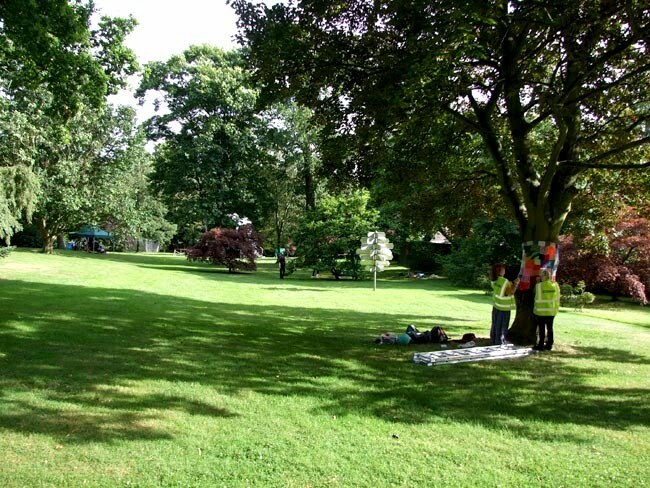 Thank you to everyone who made it over to our activity!! 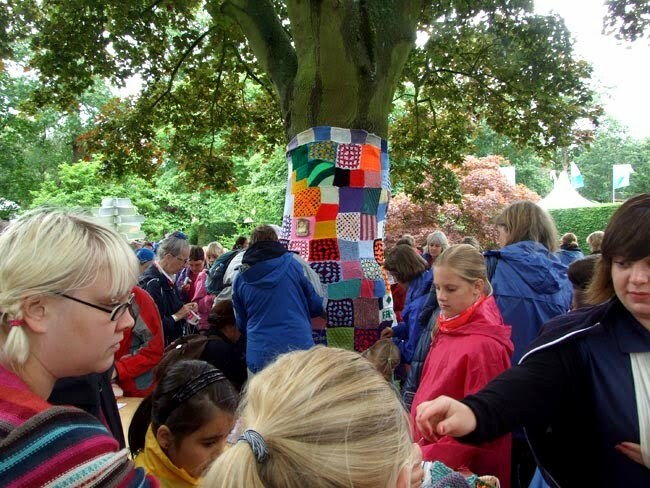 We were thrilled to bits at just how many of you took the time to knit a square and help to build the collective tree cosy. 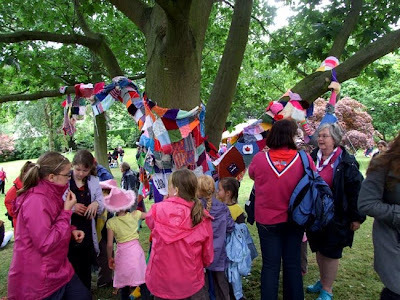 This type of event was a first for ArtYarn and we are so happy to have shared the experience of making this project with Girl Guides from all over the world. Here are a selection of images from the event... we hope you had a wonderful centenary festival and we are so happy to have been a part of it. 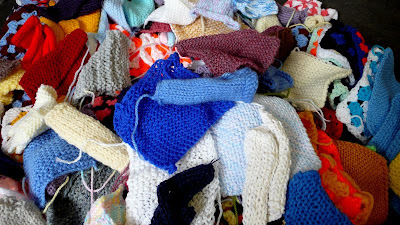 If you have any images and comments you would like to share with us, please e-mail Rachael Elwell at info@artyarn.org, and we will feature them on this blog for you. And it wasn't long before many others came to the activity tables to start sewing up the many knitted squares into bigger patches.. 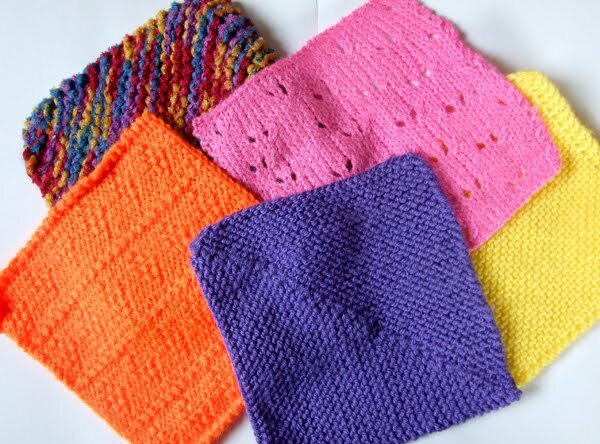 These knitted squares really stood out!! Everyone worked together to complete the Tree Cosy until it reached the ground..
And here is a shot of the Collective Tree Cosy at the end of the festival... Well done everyone!! The fun didn't stop, one tree just wasn't enough for all of you eager Girl Guides! 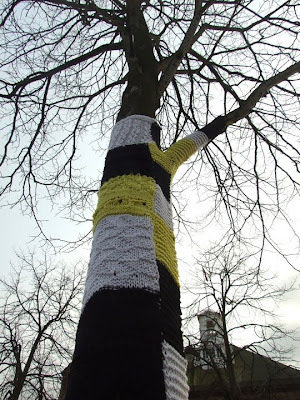 And you decided to take matters into your own hands and start a second Collective Tree Cosy! What a wonderful time we had, well done for all of your efforts and we are really happy to have been invited to make this project for your centenary celebrations. 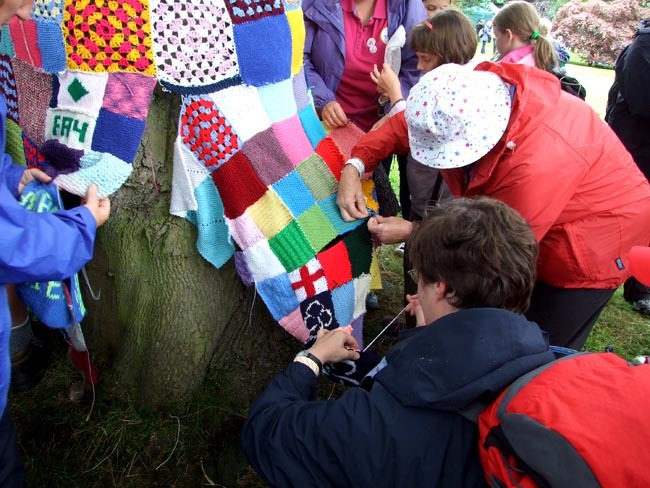 ArtYarn we're on the festival site on the 3rd August to make a start on the Collective Tree Cosy project. Rachael, and assistants Valpuri and Rachael spent a wonderful sunny afternoon installing the first squares around the tree. 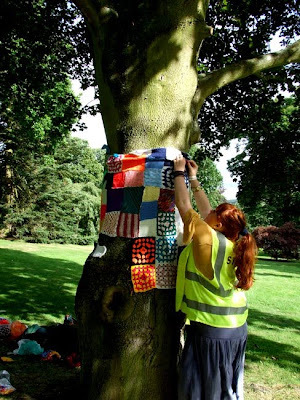 Rachael sewing the blue and white boarder around the top of the Tree Cosy. 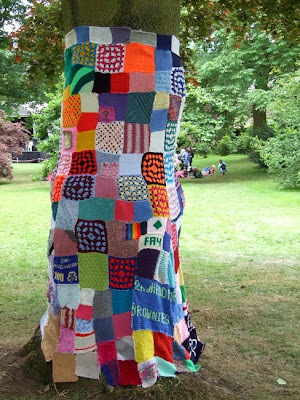 And this is how the Tree Cosy looked after the first day of preparation, all ready for the big event it's self the following day. As the festival date approaches, we're busy in the studio sewing together some of the squares we have been making to contribute to the Collective Tree Cosy installation. 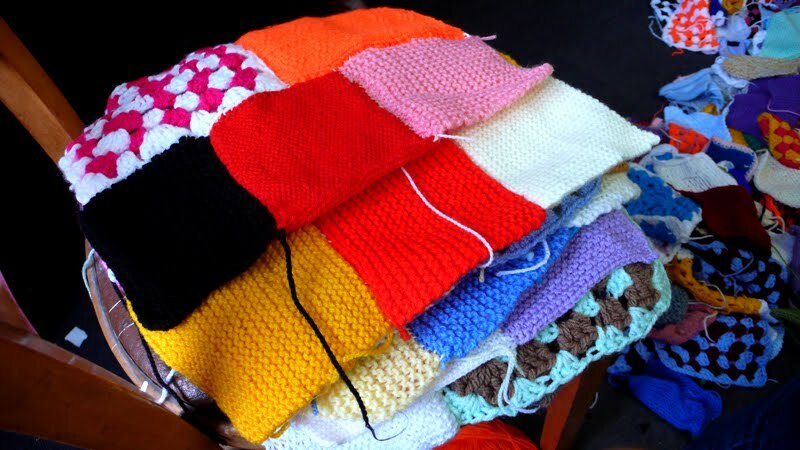 We are really looking forward to seeing all of your knitted squares too and adding them to the project. We'll be making our first visit to the site on the 3rd August to start off the installation so that when you arrive you will already be able to see some of tree covered in knitting! Here are a few pics of our time in the studio over the past week. 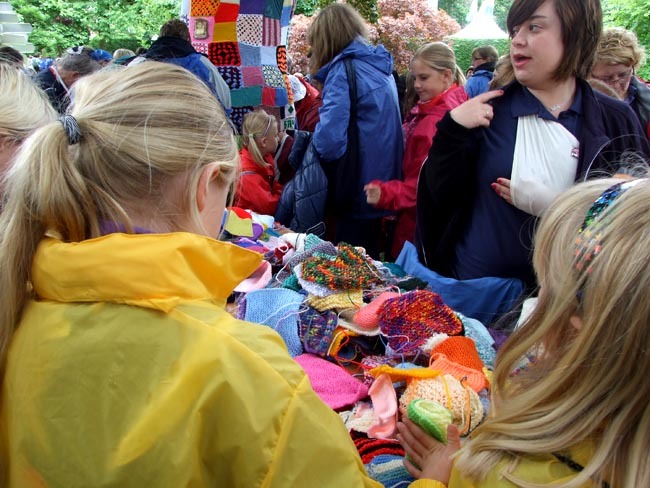 We are really looking forward to seeing all your creations on the 4th August!! 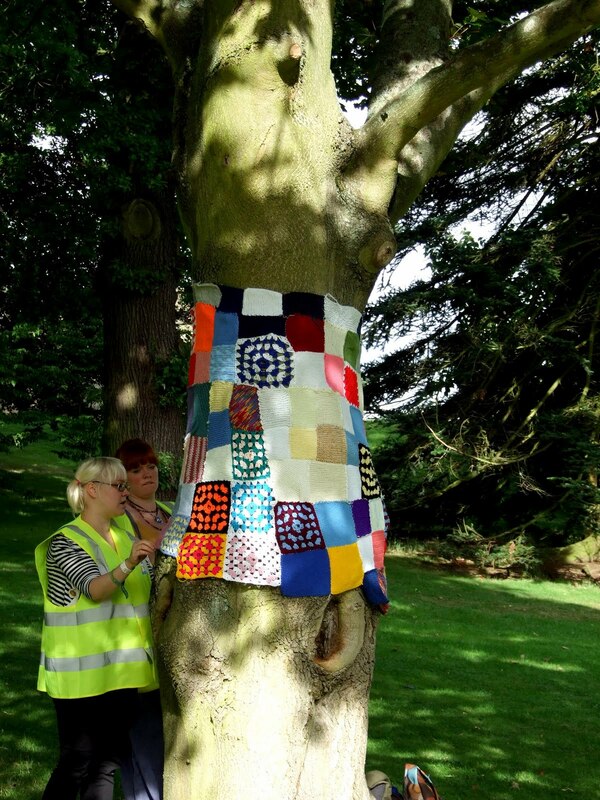 Welcome to the Artyarn Fusion blog. 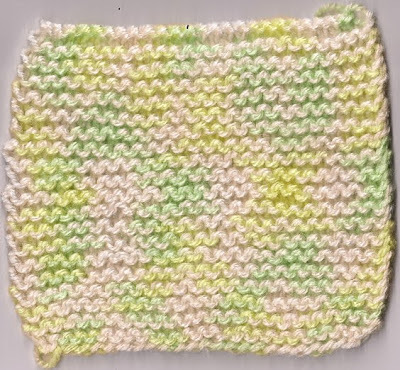 To get those needles clicking please click the links at the top of this page where you will find all of the instructions on how to cast on, how to knit and how to cast off. 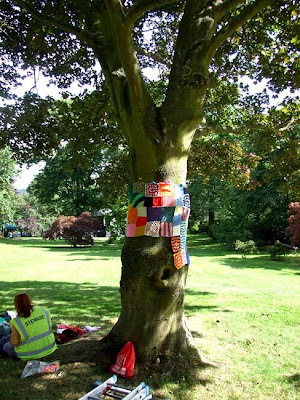 The ‘Collective Tree Cosy’ will be a vibrant knitted installation and learning activity for the Centenary event 'Fusion' on 4th August 2010; a colourful and tactile jumper to cover a large tree on the lawns of Harewood House. The ‘Collective Tree Cosy’ will be made up of individual knitted squares which will be sewn together to hug the tree neatly; creating a snug pullover that will be fitted and installed by all the participants with the assistance of ArtYarn during a sewing workshop, held around the tree at the Centenary event. 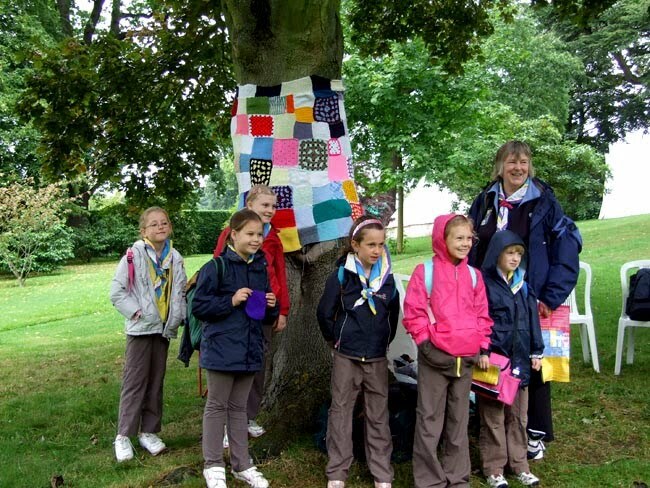 This is a brilliant opportunity for Guides and Brownies to lean how to knit, an activity that is more trendy now than it has ever been! Yes, that’s right! 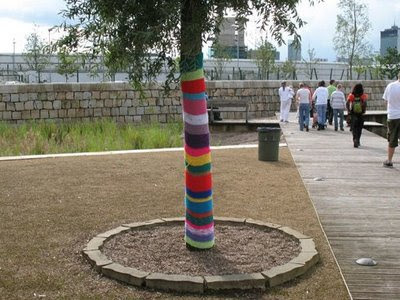 Pop stars do it and knitted graffiti or ‘Yarn Bombing’ has been the latest in vogue phenomenon to sweep the globe. 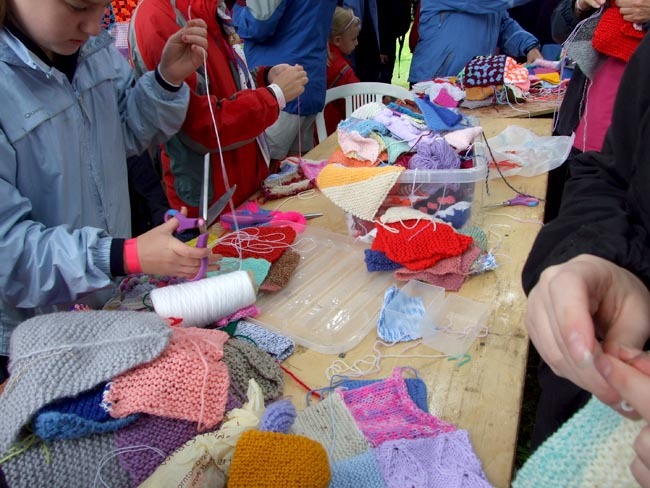 Not only that, all participants will be collectively creating a work of knitted art! There are many artists who have placed hand knitted pieces around trees to give the trees a different texture, colour and to interact with a natural objects using an artistic medium. We are hoping that with all of your contributions, this knitted tree cosy will be even bigger and better than any we have made before! And what's even better is that it will be made by Girl Guides from all over the UK. 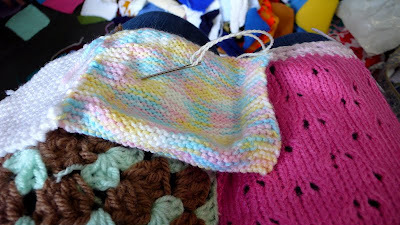 Any size needles can be used, whatever feels best. We recommend using around a 7mm needle, as this size is easy to use. 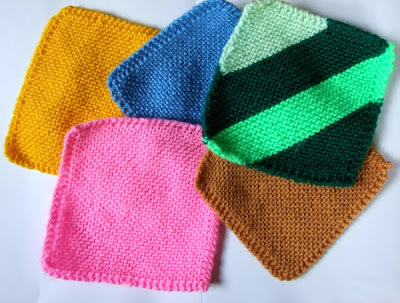 Smaller or larger needles are just as appropriate. If they come out bigger or smaller this doesn’t matter, it’s the activity and fun of knitting that counts! If you are using a pair or 7mm needles, for example, we suggest you cast on around 20 stitches. Here’s where you can get creative! Choose any colour or any kind of yarn you like. 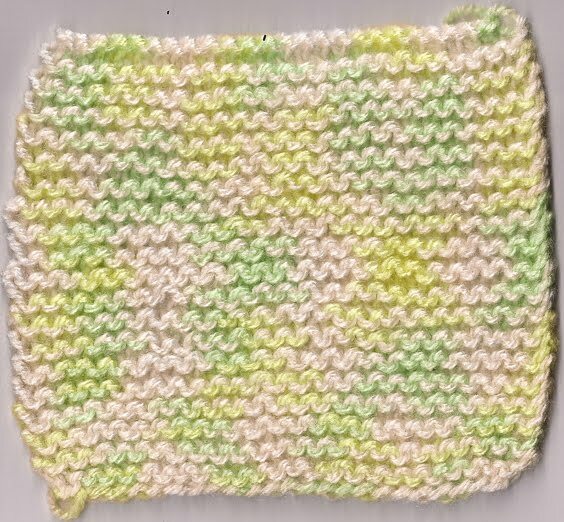 If you use large needles and a thin yarn you will get a loose loopy effect. Or you could use a textured yarn or even string for advanced knitters. 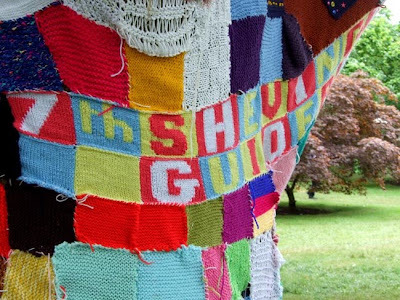 Whatever wool you like. 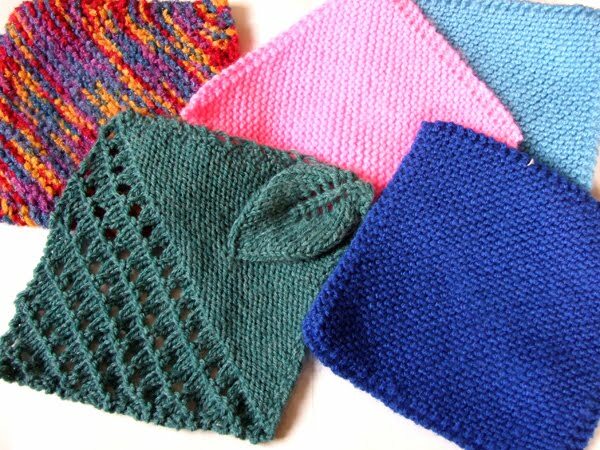 For instructions on how to knit please use the links at the top of this page or visit the external links on the right hand side menu. ArtYarn is a collaborative knitting and crochet project coordinated by visual artist Rachael Elwell. 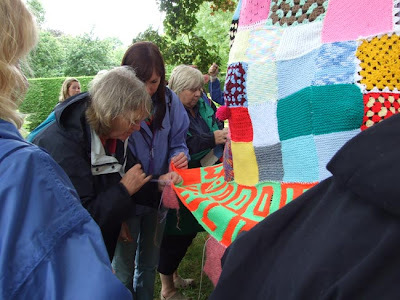 ArtYarn formed in 2008 and continue to collaborate with local community groups, world wide knitting and crochet networks and arts organisations to create gallery installations, public arts projects and creative craft workshops. 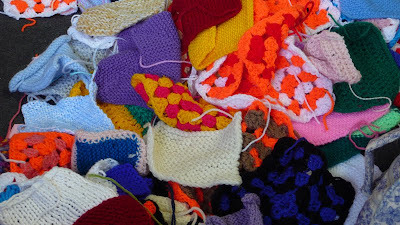 ArtYarn are inspired by the versatility of knitting and crochet as an artistic media, as well as the traditional technical aspects of knitting and crochet. This supports the creation of highly crafted art works with a contemporary outcome. All ArtYarn projects reflect the artistic, social and historical contexts of knitting and crochet, and focus on the tactility of hand manipulated processes. 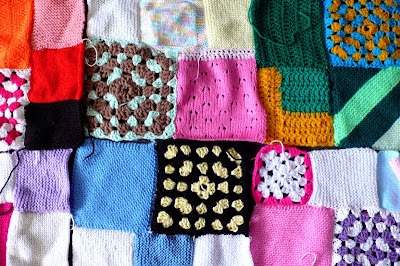 With this, ArtYarn explore individual creative expression and focus projects on devising ways to make knitting and crochet accessible through participatory making.